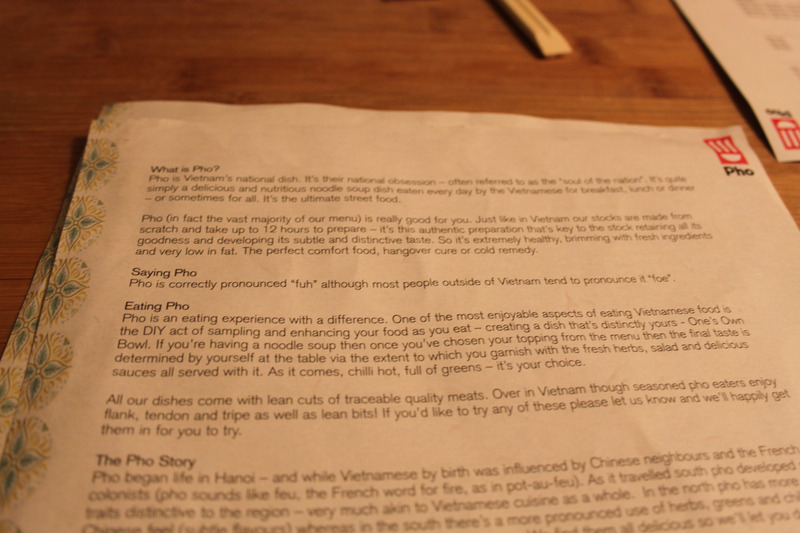 Com bi (forgive my lack of appropriate accents) is a Vietnamese dish made with broken rice. 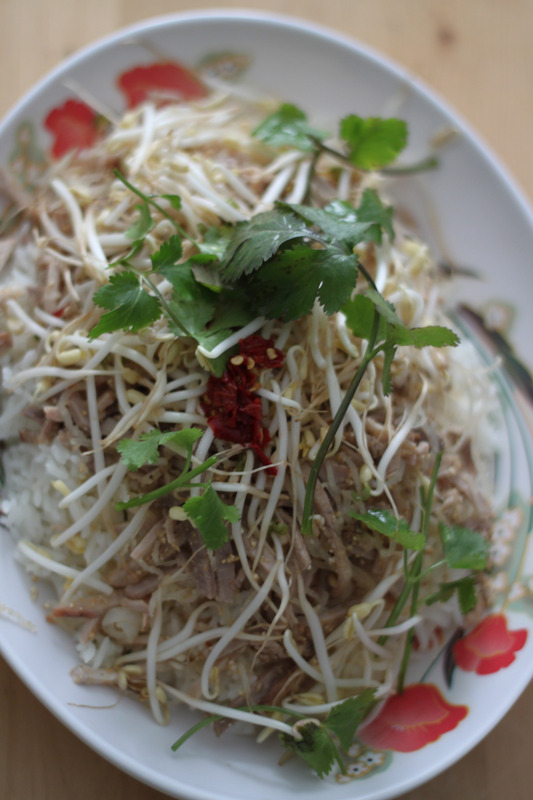 Served with your normal scented rice cooker rice the ‘topping’ is made of soy noodles (unappealing called ‘granddad’s hair’ by our family), finely sliced pork, coriander, fresh soy sprouts and chillies. The thinly sliced pork and pork fat is fried lightly while the soy noodles are just dipped in hot water until they become soft. Meanwhile rice is cooked in a pan and then crushedand added to the mix. 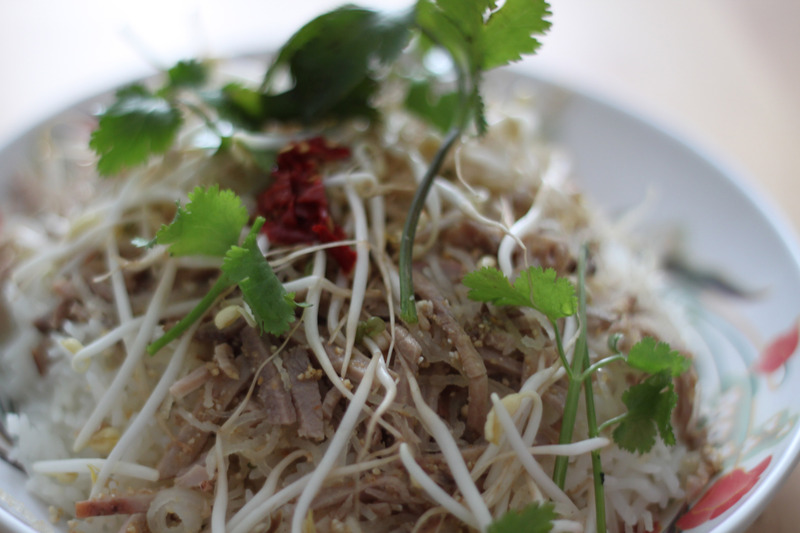 Serve with fresh coriander, soy sprouts and chilli to taste and lashings of nuoc mam! 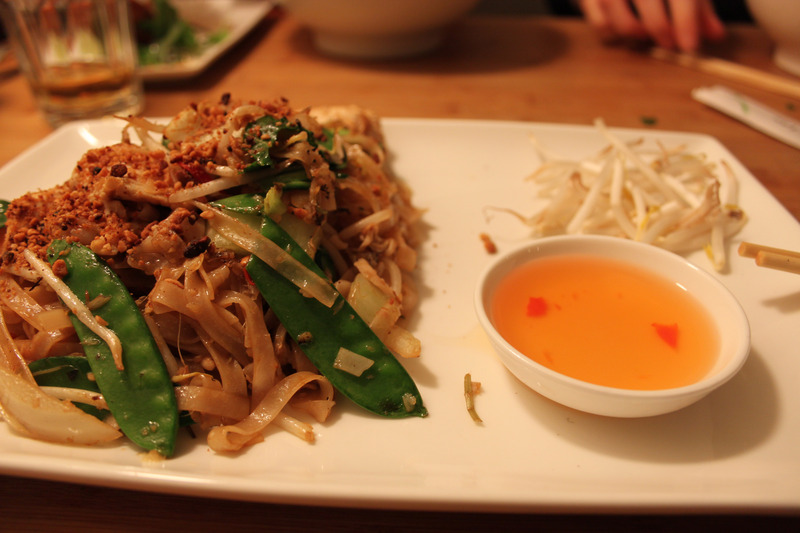 Having trawled (and enjoyed) all the Vietnamese restaurants on Kingsland road in our London days, Mr Towers and I decided to try this more commercial Vietnamese haunt with location in Shoreditch, Westfields and just off Oxford Street. 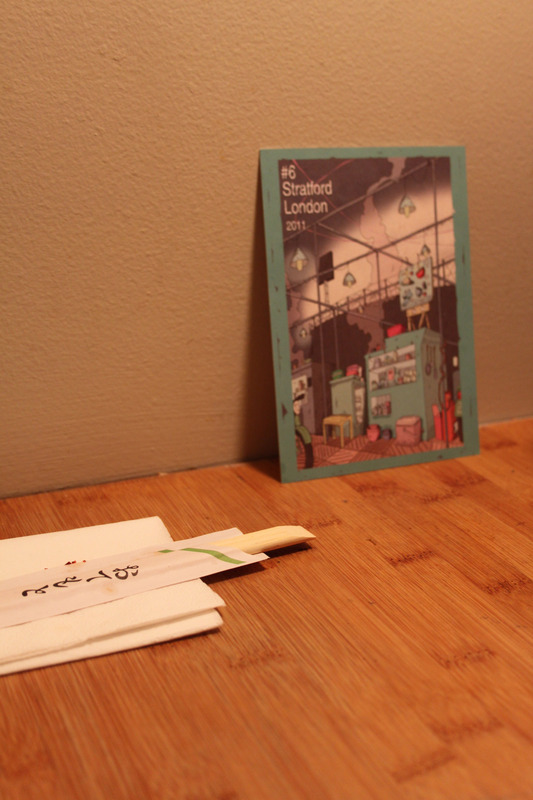 Logistics meant that we opted for the Great Titchfield street restaurant near Oxford street. 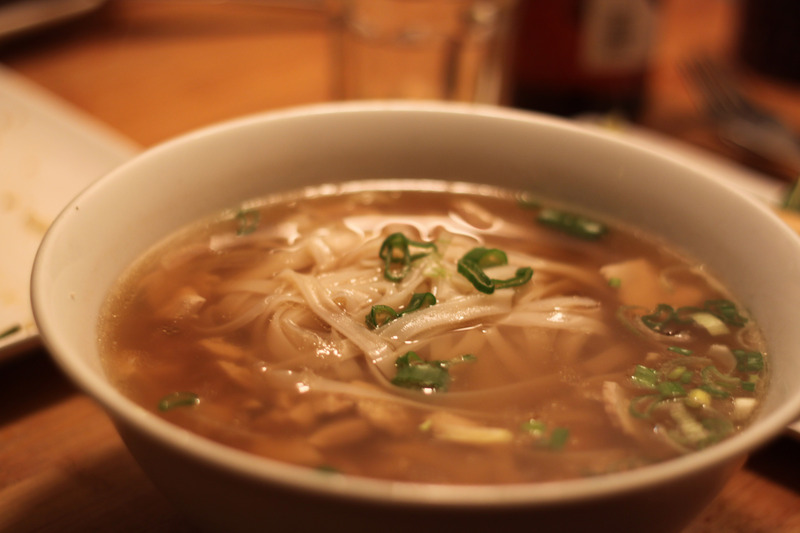 By signing up to the website beforehand, and indicating your closest or favourite restaurant location I became a ‘Pho-natic’. This gave me a 40% discount on my bill in exchange for my contact details – bargain. 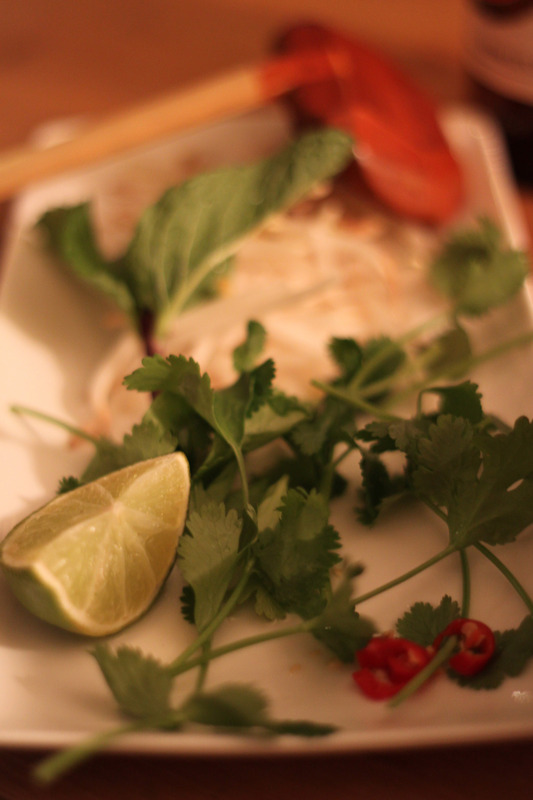 With a chilies Saigon beer we tried two starters and two mains. 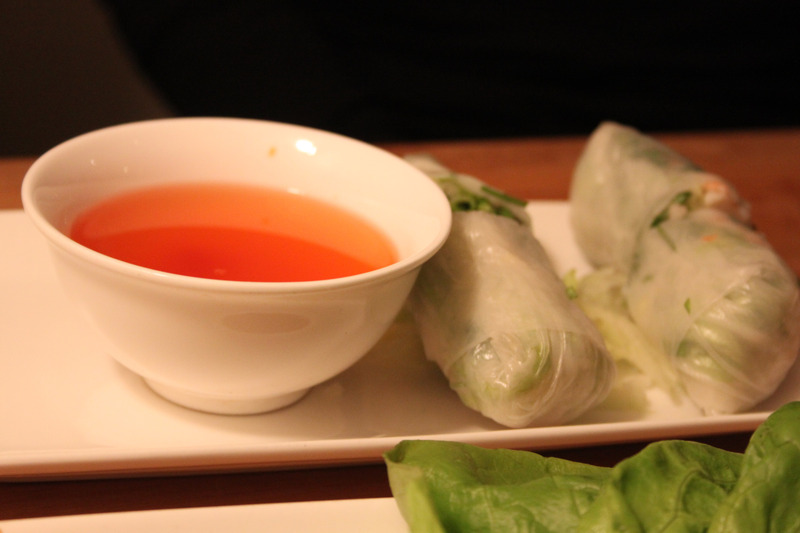 Fresh Spring Rolls- These were not made with both pork and prawn like our usual ones but just with prawn. They were nice, served cut in two as they usually do in restaurants and had carrot in them like the ones we’ve had in Hanoi. Served with nuoc cham. Have to say they were ok but a bit bland compared to our usual. weirdly crispy. Nice enough with its mix of meat, prawn, soy beans and mint but usually I’ve had this in a floppy floury version rather than crispy. All in all I was quite pleased with it though. Pho Tai or Pho with steak. It was served well enough with separate chilli, coriander and soy for me to add to my linking but it was also a bit bland. Not in spice terms but in tastiness terms. The broth was dark but lacking in flavour. I love Pho but this was really just like any soup. Maybe it was an off night or the quarter of lime was not enough to give the massive bowl a bit of zestiness but I was not really impressed. Service was good and friendly and the location very hip, but I do feel that more was done with appearances and marketing than with the actual food. 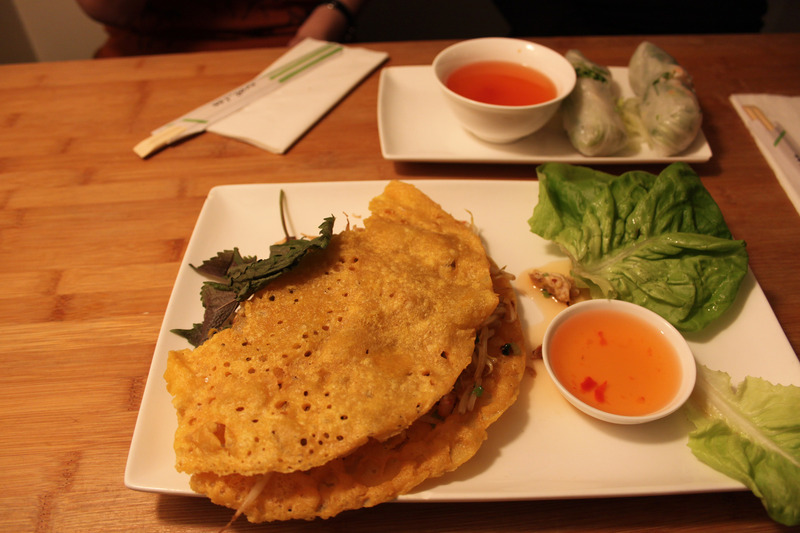 Food: Not bad but it’s not going to cure homesickness for Vietnamese food! Price: £40 for 3 people with 2 beers each, pretty good thanks to the discount!